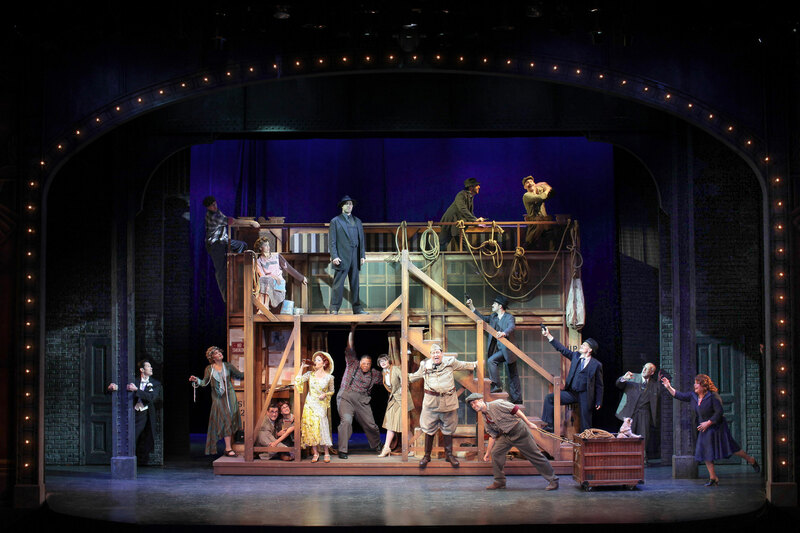 The cast of the Ogunquit Playhouse’s production of “Bullets Over Broadway.” Photo: Jay Goldsmith. OGUNQUIT, Maine – It’s the theatrical equivalent of a day at the beach, an overflowing lobster roll, and your favorite ice cream cone. The Ogunquit Playhouse production of the musical “Bullets over Broadway” is the perfect summer entertainment: Light , breezy and funny, with an interesting and original story line, well-drawn characters, and who can resist a line of tap-dancing gangsters? The dancing mobsters actually make two appearances to the delight of the Ogunquit Playhouse audience, and you have to love a show that also features a chorus line of dancing hot dogs. The musical is based on the Woody Allen movie of the same name, and Allen wrote the book based on the screenplay by he and Douglas McGrath, while Susan Stroman directed and choreographed for Broadway, with Jeff Whiting recreating both for this production. There are several fine performances leading the way, but Reed Campbell is first among equals as gangster-turned-playwright Cheech, bodyguard to Olive Neal (Jemma Jane), the dancer girlfriend of mob boss Nick Valenti (Vincent Pastore). It’s the Roaring 20’s and chorine Neal is determined to break out of the chorus and make her acting debut on Broadway. There’s just two small problems: She can’t act, and there ‘s no play for her to star in. Enter struggling playwright David Shayne (John Brochette), who’s looking for an “angel” to get his new play onto Broadway. Producer Julian Marx (Kenny Morris) calls with the news: He has a backer, but the offer does come with strings attached . The money is coming from a murderous mob boss named Nick Valenti, and he “suggests” that one of the parts in the show be played by Olive; the first meeting with Valenti, Olive, Marx and Shayne is hilarious. Shayne has plans to marry girlfriend Ellen (Bridget Elise Yingling) when his ship comes in, but meanwhile can he resist the charms of sensuous leading lady Helen Sinclair (Michele Ragusa), who churns through lovers like so much butter? Meanwhile, leading man Warner Purcell (John Paul Almon) is a man of large appetites, and eyes Olive after he gets done with one of his many sandwiches, something which is concerning to Cheech..
Sally Struthers’ annual visit to this seaside resort is expected and welcomed , and as Eden Brent, a member of the cast of Shayne’s play, toting her dog, Mr. Woofies, played by William Berloni-trained Minnie, she again parlays exquisite comic timing and some shameless mugging, which we also expect and welcome and which never fails to delight. As Shayne struggles to mount his show, Olive’s bodyguard Cheech makes a suggestion to improve the play and it clicks with both Shayne and the cast. Soon he is making plot suggestions before advancing to the dialogue and re-writes of scenes. Cheech’s proprietary interest in the work grows steadily, advancing from Shayne and Cheech calling it “our show” to making sure that nothing – including Olive – derails “his show “ on the way to Broadway. Hilarity – and gunshots – ensue. It’s always a plus when the director has previous experience with a show, and Jeff Whiting was associate director and choreographer on the Broadway production of “Bullets Over Broadway” alongside Stroman, and was director on the National Tour. This production also features Jason Ardizzone-West ‘s reimagining of the original scenic design by Santo Loquasto and the iconic William Ivey Long’s costumes. Meanwhile, the bullets are flying alongside the one-liners. So put your mind and troubles on hold, enjoy that day on the beach, the lobster roll and the ice cream, and delight in a fine cast having just as much fun as you are. The Ogunquit Playhouse production of “Bullets Over Broadway.” Book by Woody Allen, based on the screenplay by Allen and Douglas McGrath. Susan Stroman’s direction and choreography re-created by Jeff Whiting. Music direction by Robbie Cowan. At the Ogunquit Playhouse through July 29. Ogunquitplayhouse.org.